Situated in the Albufera Nature Park on the shores of the Mediterranean, not far from Valencia lies El Saler, or Campo de Golf El Saler to be precise. Javier Arana designed El Saler and it opened for play in 1968 to a rapturous standing ovation. In fact, shortly after the course opened, it was acclaimed the No.1 layout in Continental Europe. Arana built only ten Spanish courses in a design career spanning thirty years, from 1946 to 1975. El Saler, the ninth course that he constructed in a very high-class portfolio, is widely regarded as his crowning glory. The course is routed across extremely varied terrain with some holes flanked by umbrella pines and others by towering sand dunes with the aquamarine Gulf of Valencia never far away. It’s a very long and challenging course – somewhat links-like in places – and it measures 6,355 metres from the tips. Well, it’s long and challenging for most people, unless your name is Bernhard Langer. Langer loves El Saler; he posted a course record score of 62 here during the last round of the 1984 Spanish Open… a remarkable 10 under par. Actually, the two-time Masters champion returned to El Saler five years later to claim his second Spanish Open title, holding off a strong challenge from Spain’s José Maria Cañizares and Englishman Paul Carrigill to lift the trophy again. The Spanish Open has since been hosted by El Saler in 2001 (Robert Karlsson winning with a score of 277) and in 2013, when Raphaël Jacquelin claimed his fourth European Tour title in a record equalling sudden-death playoff that lasted two hours and took nine holes to complete. Javier Arana has done a wonderful job, fitting the course to the terrain in a very natural and pleasing way. The raised and invariably elevated greens are tricky to locate and they are conditioned quite superbly. El Saler is quite rightly at the top of any visiting golfer’s agenda… it’s got everything going for it. The El Saler project brought together a cluster of unique, unrepeatable circumstances that enabled Javier to work without fear of interference. The Ministry of Information and Tourism had no interest whatever in getting involved in the architect’s role, so Javier enjoyed complete freedom. The oblong-shaped plot purchased by the ministry from Valencia city council ran to about seventy hectares. It was a dream property for any golf course architect, bounded by the beach for an entire kilometre and combining an open area of gently rolling sand dunes with Mediterranean pine forest standing on flat ground. Javier had worked at El Prat and Neguri on ground sharing several of the characteristics of El Saler. In all three cases, the property features an open seaside area combined with a pine forest further inland; and, at the earlier two courses, the front nine adjoins the seashore, while the back nine threads its way among the pines. At El Saler, however, Javier found a different solution, interspersing seaside holes with forest holes throughout the front and back nines. The outcome is a splendid routing that exploits the natural setting to the full, with each loop masterfully combining the sand dunes, the pinewood and the transition between the two. One of the key features of the of the routing is the ever-present use of triangulation; no two consecutive holes are orientated in the same direction, so the player must continually adapt his game to the prevailing wind conditions, hole by hole. Although El Saler has some brilliant holes, one of the vital features of the course is the solid nature of the whole, with no holes letting down the experience. As Simpson [Javier’s one-time architectural partner] said: ‘It is not individually great holes that make a great golf course. It is rather the relationship that exists between one hole and another’. The greens at El Saler are without a doubt the finest that Arana has left to us and only the most skilled putters will come away unscathed. They are generally vast in size, at over 700 square metres each, and an average forty metres long. This size lends the course immense versatility, since holes play very differently depending on the placement of the pin, albeit at the cost of demanding greater accuracy from approach shots if overly long putts are to be avoided. Arana used various resources to create challenging green surfaces: false fronts, tiers, convex greens and small promontories surrounded by minor slopes of closely mown grass. Another highlight is the presence of more than a hundred bunkers, contrasting with Arana’s philosophy of not having more than about fifty. The average size of each sand trap is far smaller than the rest of Javier’s courses, particularly within the area of influence of the greens, where he aimed to emulate British ‘pot bunkers’. One might say El Saler is a compendium of Javier’s design philosophy, in that it encompasses all his hallmarks as a golf course architect. But the solutions to which he usually resorted are used in subtle ways, with no monotonous resemblance among holes or any sense of repetition. The result is a course that barely lets the player catch breath from the first hole to the last. I have heard that the course was difficult to appreciate because its conditioning was not very good. I found the course to be in excellent shape when I played it. The course has an interesting routing that starts out in a pine forest with unique Arregle Piques trees. The first four holes play in the trees: then, beginning at the fifth hole you start to approach the Mediterranean and get the links feel of the course. Arana designed some interesting and challenging greens with many contours. The third is a world-class par five with a blind tee shot and a double dog-leg left that plays to a narrow green. The green has deep bunkers on both sides and two trees protecting the front of the green. The fairway slopes left to right. This hole is ranked as one of the 500 best in the world according to George Peper's book of the same title. The difficult green is oblong and protected by deep bunkers on both the left and right. It is a very good strategic hole with a narrow fairway from tee to green that requires precision the entire way. The eighth is a very good short par four that plays along the Mediterranean. There is a sand dune about twenty feet high to the right of the green. The fairway snakes along to the right and then to the left prior to getting to the multi-tiered green that is sighted between the big sand dune on the right and the sand dunes protecting the ocean on the left. El Saler is worth a visit, particularly because it is near the beautiful and fun city of Valencia, which is one of my favorites in Europe. A golf course has to be pretty solid and you have to be fairly excited to see it in order to be inspired to drive 3 hours one way while on vacation to play it. Sure most people wouldn’t do this I guess (besides American golf fanatics, as I imagine they are used to that). This is exactly what I did. El Saler didn’t disappoint. I think my first comment would be how surprised I am to see a routing this interesting existing on essentially a resort pay and play course in Spain. This course is a perfectly subtle myriad of pine forest, sand dunes and sea. There is a lot to like about El Saler. Excellent and very interesting green complexes and surrounds. Fantastic bunkering, and even though there are more than 100 of them on the course not a single one feels out of place. In some cases they most certainly dictate play and strategy but in nearly every case they work. The shaping is excellent in the author’s opinion. Some of them feel like they could be sitting on courses like Woodhall Spa or Ganton. Others have a distinctive feel that you are Down Under on one of the great Sand Belt courses. El Saler for me would be the kind of course I would love to play on a daily basis, especially when the wind is up, otherwise it might be a little warm. It’s a joy to walk and very much a walking course, which is also quite rare in Spain from my experience, especially with regards to the resort courses. A glorious matrimony of land and sea. While the legendary Javier Arana was preparing the nuptial of natural topology and coastal sand dunes in 1968, he took advantage of undulating land to deliver an entertaining routing that seamlessly brings you through pine forests and out to the ocean’s edge. El Saler is unlike any other course in Spain. While many Spanish courses have views of the ocean from elevated platforms, El Saler reaches out and grabs the beach, leaving its footprints in the sand. The solid opening stretch weaves you through the forest and begins the journey to the sea. Holes 5 through 8 and 16 through 18 behold the sounds of the sea, existing in a windswept exposed state and could easily be mistaken for any venue on the Open rotation. The genius of the routing is that Arana was building a golf course within the boundaries of a nature park with significant environmental restrictions. While there are mouth-watering sand dunes available along the coast outside of the club’s boundaries, the land is sadly not available for golf development. It’s understandable that the holes along the sea get much of the attention; however those with an educated eye will see the wonder of those holes winding their way through the Mediterranean pine forest. His use of trees and bunkers to frame your line of sight is admirable. The green-sites are works of art throughout the property with fabulous shaping, most notably the natural undulations of the 8th and 17th greens. The holes just sit on the land that was given to the architect more than any other I’ve seen in recent years. The simplicity of its creation makes El Saler a world class piece of architecture worthy of global acclaim. The course demands shot-making skill and imagination, rather than power - rendering a tear in my eye as I wondered how Seve played the course. While other courses were struggling with conditioning, I was delighted to see that El Saler is getting appropriate investment and oversight ensuring top quality playing canvases. Many of the holes are among the Top 500 holes in the World (eg: par 3 17th) and you can feel it as you walk around a very unique layout. The bunkers are works of art and always feel in the right place, which is a testament to their creator as there are more than 100 of them on the course. The design of the sand traps are a dangerous mix of beauty and deception, and often reminded me of the pot bunkers in the British Isles or the murderous pits at Ganton. In my humble opinion, El Saler is not only the #1 course in Spain, but it’s a glaring omission from the Top 100 courses in the World. I just played this outstanding golf course last week. In a mist and in bright sunshine it is beautiful from start to finish. I tend to be difficult to please and tend to note negatives more freely than most and think that is what keeps the spread of the top courses, the drawbacks or places for improvement.Routing of El Saler is so well-thought out, it is forever re-orienting so that wind direction can be difficult to ascertain. Deception in a golf course is a great positive. Blindness, especially in the first nine is an integral part of especially the tee shot. The only negative to the routing is that the practice area is located between holes 16 and 18 and consequently the natural contours of the rolling dunesland is minimised most on the sixteenth, just below the range. The hole is still interesting but it stands out for this difference.The first nine is far more wooded in more places and currently are a little rough and neglected but not to a degree affecting course character. The conditioning of the turf of the fairways is not what one expects in a course of such pedigree, but it is an area often given too much emphasis in modern times. Green surface turf is however mostly free of the inconsistency of the other areas, they putt extremely well/ The green and green complexes are wonderfully designed and require top reading skills to putt effectively.Bunker sand is dense, firm, local sand and can be managed once again requiring true skill to negotiate, none of this modern manufactured preened artificiality.One hole merits special discussion. The short Par 4 eighth has a larger version, mirror-image postage stamp green complex requiring bold position seeking off the tee. A marvel of a hole that you might miss. No one can miss the greatness of 17 and 18. There are several others, but I wanted to single out #8.So, perhaps there is a lesson to be learnt here, architectural trumps all, conditioning is so over-rated. This is joy to play. AS good as I have seen in Spain. El Saler is set in a natural landscape of great beauty, Albufera Natural Park, where the mediteranean forest meets the sea through a large natural lake which communicates with the same Mediterranean. Consequently, the location of the course in this privileged place will provide more interest to the course, which happens to be certainly one of the best in Spain. El Saler presents an interesting contrast of holes as part delves into a typically meditarranean pine forest, while the other is along the coast and presents a challenge and an aspect close to that of the British links, windswept and with typical coastal vegetation with. In any case, the whole course is characterized by firm and rolling fairways and large undulating greens, so if it is not played exactly as a links, it is as close to it as you can find in Spain. Although it might be a little short by the standards of the golf championship today -an assert the Open 2013 Spanish Open seems to deny- El Saler guarantees fun and challenge for the average player and at a climate that allows play all year. Among its holes I would highlight 3rd, a par 5 that draws a curve to left, and to a well protected green, the 7th, a short but beautiful par 4, the 8th, a seaside par 4 that takes us to Ireland with a fairway diagonal to the tee and a second shot to a green perched between the sea and a dune, and the last two holes, which pose a stern test to end the round. In conclusion, El Saler is a must for anyone who is in the region of Valencia and great fun to every player, although a tough test. MMdeA, Barcelona. I first played El Saler 11 years ago and, although a very good course, did not rate it as excellent. That was down to its overall conditioning and unwisely I let that affect my overall view of the course. All those years ago I would have given it 3/6. I then watched the Seve Trophy played here and thought the course was in absolutely brilliant shape. Although I did not play during that week. I have now played the course more than half a dozen times and its classification is now 6/6. Why the change. Well, the course has pretty much stayed the same routing but the conditioning has improved immensely. This is not a top top course for conditioning (as seen at PGA Catalunya or Finca Cortesin) but that is not what this course is about. This course is very technical and difficult in most parts. If you're serious about golf and want a real challenge then this course is for you. Best holes would have to be 17 and 18. A great par 3 at 17 and a superb closing long par 4 with one of the hardest drives you'll have. Overall. 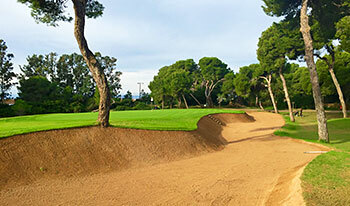 A fantastic course that is a MUST play when you're in the Valencia region. Rate the course on how it plays, not how it looks and you will enjoy it immensely. I played El Saler some years ago and only just read some of the reviews.There was one comment that I think sums up many reviews: do you judge a course by it's conditioning and presentation or by the quality of shot-making necessary and layout of the course? It should be the latter.When it comes to El Saler it has to be the latter. Firstly the course is situated in a National Park and there are many restrictions on what the course staff are allowed to do. So, yes, it does appear to be a bit unkempt and scruffy but the playing - that is a different story. Probably not too bad when there is no wind but very tough with wind. El Saler has the best placed fairway bunkers on any course I have played (that includes the Old Course & Turnberry amongst others) and avoiding them is not so easy. The greens are not so easy either - Bernhard Langer's course record of 62 shows how good a player (and even putter!) he was and still is. If you play the course you will wonder if that sort of score is possible!9 holes are in woodland and 9 very linksy – a nice combination. My recommendation – just play the course but don’t look too closely – judge on how it plays! just back from our spring buddy trip. this time we played courses in the valencia region (el saler, el bosque and la galiana).i liked the layout of el saler a lot. fairways and greens in top condition. tee boxes were totally out of shape though. frst 9 holes are stronger than back nine. classic 60s feel upper class clubhouse. all in all well worth a visit, but not as stunning as i hoped for. Played the course in June 2010. A bit difficult to find, heading north from Javea. Ended up driving through paddy fields!. On arrival the clubhouse is very much 1960's decor, but blends in well with the beach/sea surroundings. The course was lovely. Found the greens to be very fast and undulating and the fairways very soft, but nice mix of short/long par 4's and varying par 3's. Thought the best holes were 5,6,7 and 8 but the course could have made more of the coastal location - Would definitely play again if in Valencia for a weekend. A wonderful course fully meriting its ranking. I have played 30 plus courses in Spain and this is numero uno. The nearest comparable course in England would be Formby with a mix of tree-lined holes and linksland. The best holes are the inland par 5 3rd, together with 8, 17 and 18 on the coast. Some of the comments are mystifying "only once has it lived up to the hype", are you evaluating a course on conditioning and presentation, which will vary throughout a year, or on design and shot values? The Blog Playing the Top 100 Golf Courses in the World gives a very fair appraisal and has some nice photographs. I think you're always wrong ranking El Saler not as it really is: Number 1 in Spain and top five in Continental Europe. I'm 52 and began to play golf at Madrid's Club de Campo (another Arana's jewel) at 7 years old, having played in the most famous spanish courses, and I can say that any golf course in Spain, old or new, can compares to El Saler. Please believe me. Thank you.